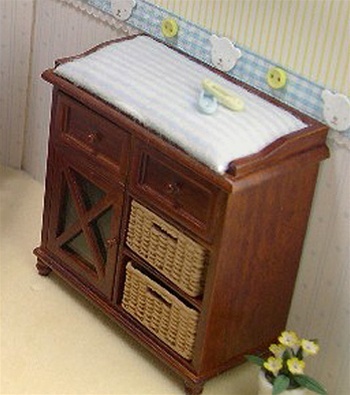 This is a charming wooden changing table with a Spice stain finish. The piece has a back rail and two sloped side rails on the top, two recessed panel drawers across the front, a cupboard with an "X" embellished doorfront on the left and two open shelves on the right. The drawers and door have matching round wood knobs. The piece has a removable cushion that fits snugly against on the table top and 2 faux "wicker" baskets. The two open shelves have approximately 5/8" clearance. This chest is perfect in the nursery as a changing table, but remove the cushion, add a bar set, plant or other accessory and its the perfect piece for the dining room or living room. Top cushion comes in either Pink or Blue stripe. Please select your preference above. Table: Width: 4-5/8", Height: 3-1/16", Depth: 1-5/8"
Basket: Width: 1-3/8", Height: 11/16", Depth: 1-1/4"